VENTURA — Students Abby VanMuijen and Hilary Bush, along with 2011 grad Kit Donovan, describe AIDS LifeCycle Day 6, Friday’s leg from Lompoc to Ventura, where the day ended with a candlelight memorial on the beach. These riders are part of the Cal Team, which cycled from San Francisco to Los Angeles to support HIV/AIDS services and awareness. Today I took the sag bus, the bus that transports riders who, for whatever reason — health conditions, injuries, unfortunate post-Red Dress Day sunburns and melodrama — are unable to ride to the next camp. It’s the bus that no one wants to be on. As we drove down the coast through Santa Barbara, all eyes on the bus were glued to the ribbon of cyclists on our right. The 82 miles of highway rumble strips, never-ending hills, and all-you-can-eat ice cream that they would spend an entire day conquering, we covered in about an hour and a half. There were broken arms, torn calves and shredded knees on that bus, but not a soul who didn’t want to be on the other side of the window, battling it out with everyone else for the ride’s 545 miles. But just as that thought crossed my mind, the woman sitting to my left reminded me of something important. 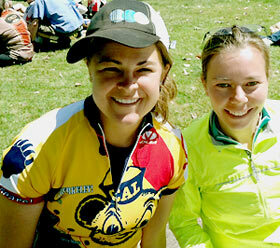 Abby Van Muijen with a friend from the ride. “How much money did you raise to participate in this event?” she asked. 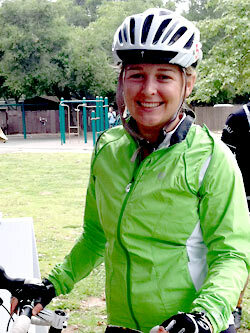 That’s when I realized that I had fundraised more than $7,000 in total for AIDS Lifecycle. I may not have been able to ride every single mile, but I had contributed $7,000 and help someone in need. That’s more money than I have in my bank account and more money than I would have ever thought myself capable of coming up with. When I asked the woman sitting next to me how much she had raised in total, she proudly stated that this was her tenth AIDS ride and that in total she had raised more than $50,000 for the SF AIDS Foundation. Sure, 545 is a big number, but $50,000 is a lot bigger… The people on this ride are inspiring in more ways than one. I’m going to ride into L.A. tomorrow if my knee breaks off and I have to sit on someone’s handlebars. But more importantly, I’m going to keep battling, together with this phenomenal group of people, both on and off my bicycle. Every year on the AIDS LifeCycle, riders, roadies, family and friends come together to light candles in honor of people living with HIV and AIDS. The ceremony takes place on the beach in Ventura, and it is a time to remember those living with AIDS, those we have lost because of the disease, and the reasons we ride. This simple ceremony allows each individual to independently reflect on their experience with this amazing community. Sitting in the sand alongside the crashing waves, a circle of 2,000-plus people takes a moment away from their hectic lives, leaving work and other thoughts aside, to reflect on the disease and the people it has affected for the last 30 years. Because of our involvement in this amazing ride, the direct effects of HIV and AIDS have become clear. We see that HIV is not always a completely debilitating disease when the HIV+ riders kick our butts up the hills. We have met people living with AIDS, those who have lost family and friends to AIDS, and others dedicated to finding a cure. One rider in particular, Ken Pepper, has provided extravagant entertainment and much-needed comedic relief throughout the week. His unexpected humor and ability to make strangers feel like family has been a highlight of the week. Pepper has participated in 14 AIDS Lifecycles throughout the years, passing pepper necklaces along to riders he has touched along the route. He has dubbed us his “Pepperettes”, but behind his mischievous smile is a loving man honoring his brother who died of the disease. Ever since his brother’s death, each final day of the ride is especially meaningful to him. Along the route, his brother and mom used to cheer him into L.A., but now at the spot his brother used to sit, his daughters show their father support, in memory of their uncle. Living in a tent for a week, constantly getting a whiff of Porta Potty, and tolerating sore butts, these past seven days have challenged us. We ride into L.A. tomorrow greeted by supporting friends, family and strangers, all connected by one strong desire to end this disease once and for all.